From adopting a minimal sense of style to emptying out several overflowing closets and drawers in our home, I’ve been on a quest to find ways to simplify my wardrobe. It hasn’t been easy because I still LOVE a good shopping or thrifting trip. However, I’ve become much more aware of the clothes I already own. I’ve also become an expert at remixing certain items to wear during different seasons. 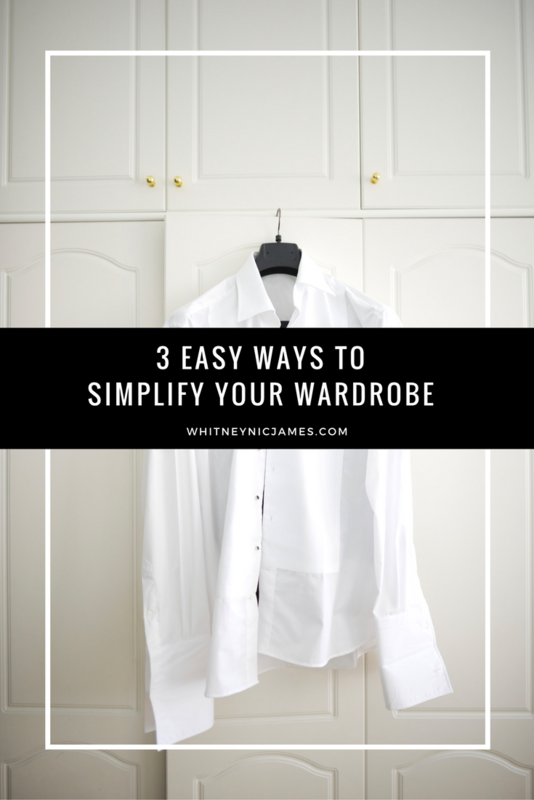 If you want to try minimizing your wardrobe this season, here are 3 easy ways to simplify your wardrobe. 1. Purchase more solid colors. | This is a small and easy step that can easily help simplify your wardrobe. Buying more solid colored clothing allows you to mix & match your items more often, which in turn helps ease the stress of figuring out what to wear every day. 2. Create a work uniform. 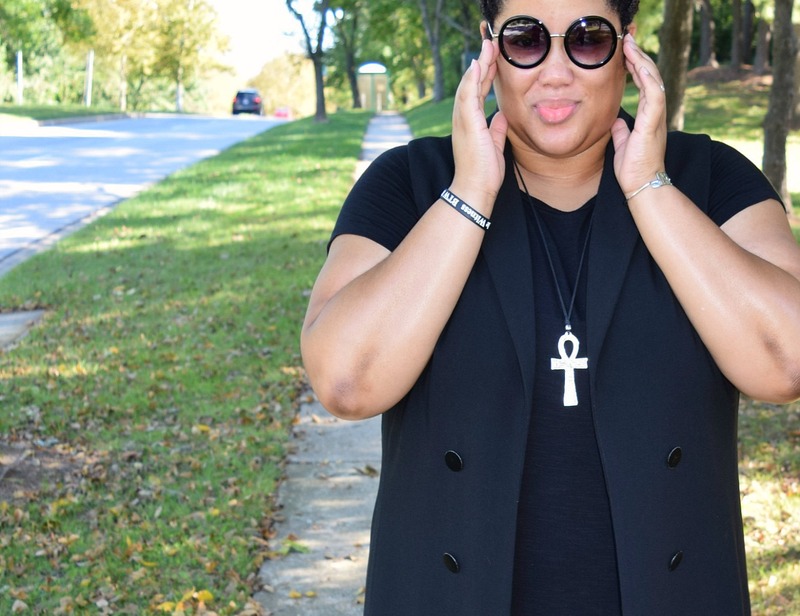 | I pretty much wear the same 5-6 basic pieces to work each week. To keep things interesting I switch up the accessories/shoes, add a vest, kimono or cardigan and change up my jewelry. Creating a work uniform has made getting dressed in the mornings a breeze. No worries; I’m still stylish, chic and cute every day at work! 3. Declutter your space little by little. | We often want to get rid of our junk right away, all at once. However, if you declutter little by little, one closet or drawer at a time, it’s less overwhelming. It also makes decluttering and reorganizing a more realistic task for you to complete. I also suggest wearing purchasing a few all-black wardrobe staples. 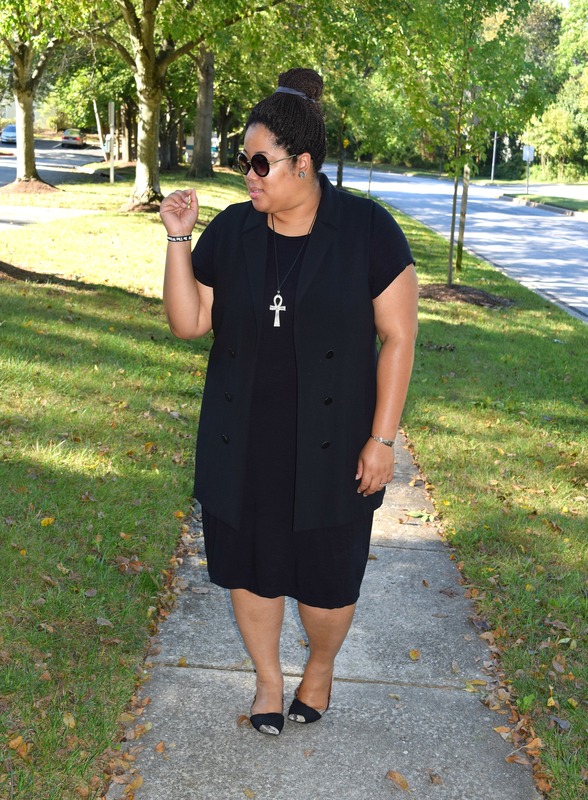 A little black dress, a black vest, a couple pair of black leggings and a few black t-shirts can do wonders for your personal style! As I mentioned over on Instagram the other day, I used to think wearing all black was boring. But I’ve learned that with the right accessories, an all-black outfit can be just as exciting as one with color and prints. So tell me, do you have any tips on how to simplify your wardrobe? Let me know! 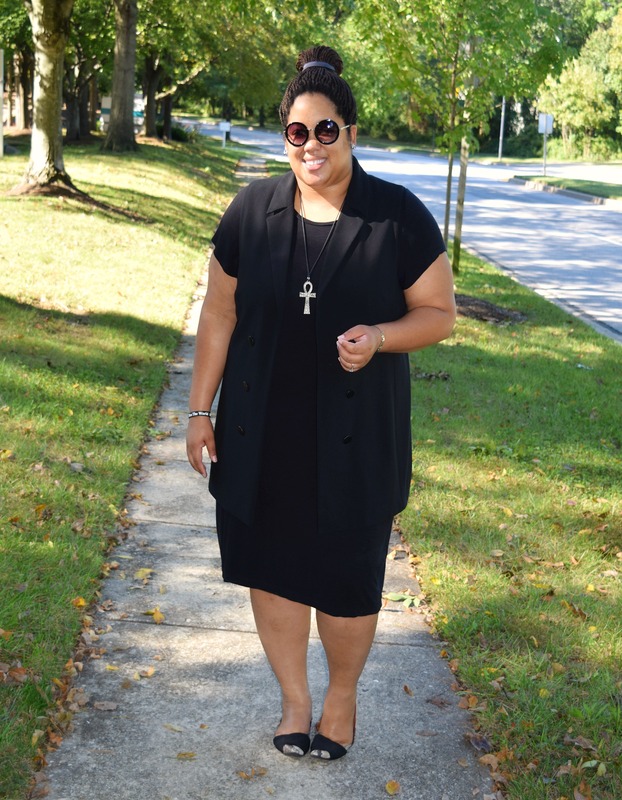 Thanks for reading and be sure to let me know your thoughts on simplifying your wardrobe, as well as my all-black outfit, below. I love reading and responding to your comments! Until next time, be blessed and stay safe…XO! Those are the great tips. I used to have tones of clothes and nothing to wear, but now I am trying to buy only things that I can match with other things and I simplified it a lot. Mostly classic pieces that mix and match with a tons of cute accessories. Thank you! And classic pieces are the best. So necessary! Very good tips, I need to remember to declutter one at a time. Thanks, Rachel! That tip has helped me a lot. 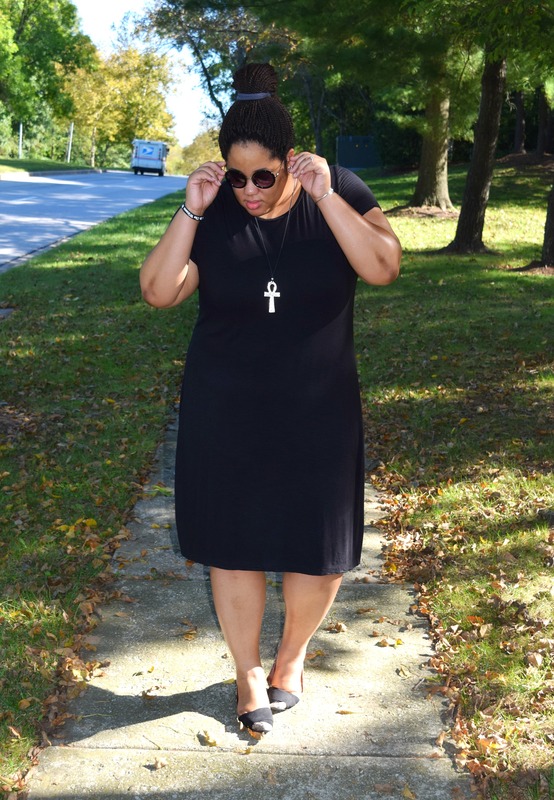 Loving this all black look Whitney! I just cleaned my closet this past weekend. I found several things with tags still attached *insert sad face emoji*. However, like you I’m more conscious of the things I have in my closet and it makes shopping a breeze. I just have a few holes to fill and I’ll be set for a good while. Nice tips and I really love your fun shades. Great tips. I maximize my wardrobe by buying classic pieces in neutral colors. I am known for wearing a lot of bold vibrant color, but I often pair them with neutrals. I find that with neutral shades everything does with everything and you get more mileage out of your wardrobe. Thanks for reading! And yes, I agree 100% about how you add neutrals to your outfits. You look fabulous! Great monochromatic look. I enjoyed all of your tips, but especially the one about decluttering one thing at a time. It is so easy for me to become overwhelmed. I use to get overwhelmed so much when cleaning, so I had to figure out how to clean in a less stressful way. LOL! I totally need to adopt a work uniform, and i need to declutter! I love the all black look, even though often they intimidate me. Yes, the uniform saves me so much time in the mornings! And like you, I need to de-clutter a few more areas of our apartment too. I still have so much “stuff”. You look great… and you already know Sis I purge but seems like the more I purge the more I have… uggh!!!! I really need to simplify my closet and if I don’t wear it then toss it!!!! Awesome tips… I’ll take them into consideration I can always take baby steps… this is another way life can be less chaotic because I wouldn’t have to go through tons of clothes that I don’t wear. Thanks again for sharing these were great! Thank you SO much for reading & commenting! And yes, baby steps is the key. I’ve had to learn that. Thanks so much! And yes, the more simple the better for me. 😉 Hope you’re doing well…xo!